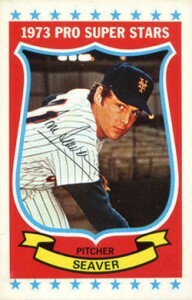 Kellogg's baseball cards are known primarily for one thing: their 3-D designs. For whatever reason, 1973 Kellogg's Baseball passed on it and went for a more traditional look. It's a one-year blip but it makes the set notable more for what's missing rather than what's there. The checklist maintains the previous year's 54 cards. 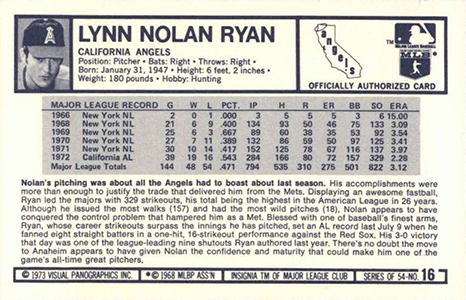 Among the highlights are Hall of Famers Nolan Ryan, Reggie Jackson, Tom Seaver, Willie Stargell and Al Kaline. There's also Pete Rose who can be mentioned in the same breath as the Hall of Famers, but he's in a class by himself. Other than the lack of lenticular 3-D, the overall look of 1973 Kellogg's Baseball is consistent with other sets from the cereal maker back then. The tops and bottoms of the card fronts have a line of stars, a shape the Kellogg's folks love to incorporate into many of their designs. Player images are inside a shield. This element wasn't used in other sets as a photo frame, but Kellogg's used shields as a spot for the player's position. Card backs are consistent with other years. They come packed with a small portrait, vitals, full stats and even a writeup. The text is understandably small so it can be a little tricky to read. 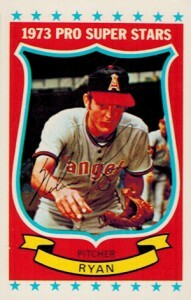 1973 Kellogg's Baseball cards measure 2 1/4 by 3 1/2". This is slightly larger than their 3-D sets. Starting in 1973, collectors could not only get cards in cereal boxes, but they could get an entire set in a mail-away offer. Today, this makes the cards more common. It also means that it's not too difficult to find them in top condition. Because of this, the set (and most Kellogg's sets going forward) is much more affordable. POP 50 *PSA 9* 1979 KELLOGG'S GAYLORD PERRY #49 HOF "1973 HITS 315"